Aurola Holiday Inn is the Only 5 Star Hotel in downtown San Jose. Spacious modern room with two queen beds, free wireless, HSIA premium bedding, work desk, cable TV with premium channels including HBO, complimentary electronic safe, AC, mini bar at a charge, coffeemaker with britt coffee, complimentary use of guest robes, modern bath shower with hairdryer. Featuring free wireless, HSIA premium bedding, work desk, cable TV with premium channels including HBO, AC, coffeemaker with Britt coffee, free safe, mini bar, modern bath shower. When you visit Costa Rica, you definitely want to be near all Costa Rica`s attractions. 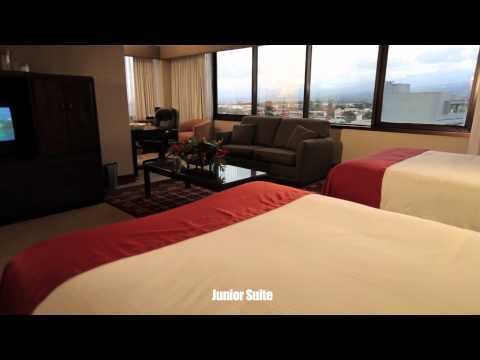 The Aurola Hotel is the only 5 Star Hotel located in downtown San Jose, the capital of Costa Rica. Just a stroll across the park, museums, nightlife, shopping, financial and government centers. The mirrored glass tower is one of San Jose landmarks, reflects the ever-changing tropical skies above this exciting Latin American Capital. The Aurola Holiday Inn located in the heart of shopping district, commercial offices, museums, theatres and cosmopolitan nightlife. Well, come on in and take a look around! The lobby is San Jose premier meeting and greeting place for friends and strangers alike. The use of tropical hard woods, stone and indigenous plants in the decor provides a welcoming atmosphere with a native touch. One Formal Restaurant El Mirador, on the 17th Floor offering a magnificient view of the city. Available for Dinners Only. Tropicana Restaurant available for Breakfast, Lunch and Dinner. Indoor heated swimming pool and Hydro-Massage Jaccuzy. Executive Floor Available with International Phone Calls to USA and Mexico FREE. Happy Hour 5-7 p.m., Continental Breakfast, Coffee and snacks during the day, sodas and juices included. Small Meeting Room upon request. On-Site Casino 11 a.m. - 4 a.m. Live Music over the weekend. The Aurola`s spacious, tastefully decorated rooms and suites are designed with your comfort and safety in mind and most offer incredible views of San Jose Costa Rica city and mountains beyond. You`ll understand why Costa Ricans are known for their friendliness the minute you are greeted by courteous, bilingual doormen and Reception Associates. At your convenient guest services booth and tourism center, you can get information about local tours and attractions.